Mario & Luigi: Dream Team is the fourth entry in the Mario & Luigi handheld RPG saga, which started on GBA all the way back in 2003. You’d think that Nintendo would be running out of ideas by now--a worry exacerbated by Princess Peach getting kidnapped again a few minutes into this game. But, incredibly, Dream Team turns out to be one of the most imagination-rich RPGs around. Much like Mario Sunshine, the game takes place on an island resort, here named Pi’illo Island. If that sounds like the word ‘pillow’, it’s with good reason. The game is all about sleep, or, to be more specific, Luigi’s ability to fall asleep at the drop of a hat. When he falls asleep on a special stone pillow, a warp opens allowing Mario to enter his brother’s dreams. Game time is split between the ‘real’ world’ and the ‘dream world’. While ‘real world’ exploration is the usual top-down RPG style of the series (only now with rather lovely 3D environments), the dream sections are mostly 2D side-scrolling affairs. These look beautiful with the 3D switched on. But don’t expect New Super Mario Bros-style goomba-stomping. The action here is much more workmanlike and geared towards puzzle-solving over twitch platforming. 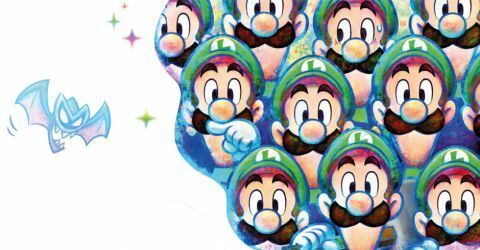 Some of these puzzles involve Luigi’s face. While in the dream realm, you can always see Luigi’s dozing mug on the touch screen. As you progress, different interactions become available, allowing you to tickle his nose to make him sneeze, or pull his moustache, for example. It’s a cute novelty, especially as it harks back to Mario 64’s famous 3D Mario head intro sequence, but it also impacts the gameplay by affecting the events on the top screen. Tickle Luigi’s nose and he sneezes, creating gusts of wind in the dream realm. Pull his moustache, and you can twang Mario to higher ground, for example. It feels silly to use Luigi’s moustache as a catapult, but it’s more endearing than simply using a ladder. "Dream Team turns out to be one of the most imagination-rich RPGs around." This gentle sense of humour is prevalent throughout the game, whether in the enjoyable dialogue scripting or the faux-Italian nonsense the brothers occasionally spout during cut-scenes. In fact, there's generally a laid-back vibe throughout the game, despite the occasional moment of high drama. The colourful, sunny visual style complements the gameplay perfectly, as does the superb soundtrack that gives the production a big-budget feel. The game world is impressively large, although it’s disappointing to find that the castle you visit at the start of the game becomes inaccessible for the next ten hours of gameplay, even though it looks like it was always intended to be a base for your adventure, full of support options. Furthermore, the game is surprisingly linear, giving the impression of freedom while only really offering one logical course of action at any one time. As in previous entries (and Paper Mario), the battle system allows you to press the jump button in real-time to add extra power to stomp attacks. The jump button can also be used to make evasive manoeuvres, which--when timed correctly--can even be turned into effective counter-attacks. However, battles inside and outside the dream realm play out very differently. "The colourful, sunny visual style complements the gameplay." While dreaming, Luigi isn’t restricted to one self. Sometimes there are so many of him, Mario can roll him, katamari-style, picking up more and more Luigis until he is a massive ball of green and blue, perfect for smashing into groups of enemies. Scenes like this play out in 3D and make use of the 3DS’ tilt function for steering, which makes a welcome break from simply tapping the jump button at the correct time. This multiple-Luigi mechanic also becomes useful in the 2D dream sections, allowing Mario to stand on top of a pillar of Luigis which can lean off ledges to push switches and stomp through some rocks. More Luigi abilities are drip-fed as you progress, each one more outlandish than the last, which means you’re always keen to see what the next one will be. The game may be predictable for the most part, but boy, does it know how to crank up the dial when it wants to. At one point, you’re asked to turn the 3DS on its side, whereupon a massively detailed 3D battle plays out via both the 3DS’ screens. It’s full of stand-out moments. "This is a highly polished product that is charming and entertaining in equal measures." Dream Team has its flaws, of course. You’re almost always controlling both Mario and Luigi, which can get frustrating, especially as each one has his own jump button. That means tricky platforming sections have to be simultaneously navigated with both characters, which can be a bit much to get your head around. It’s hard to accept you’ve failed when Mario’s standing triumphantly on the other side of a gap, disappointingly sans-sibling. The other main point of consternation is the way that some of the 2D levels in particular feel like filler. After a cleverly designed stage that makes full use of the touch screen mechanic and interesting platform puzzling, a by-numbers platforming level can bring the experience back to earth. It’s also not uncommon to fight the same enemy type with the same moves three or four times in a row, which can start to grate. Despite occasionally falling victim to its own scale, this is a highly polished product that is charming and entertaining in equal measures. The dream-based plot gives Nintendo license to be as creative and insane as they like, which adds up to one of the most inviting game worlds on 3DS so far. And it has endeared us still further to Luigi in his showcase year. Who would have thought the inside of his head would be so interesting? Description The next installment in the Mario & Luigi role-playing series is comes to Nintendo 3DS, taking place inside the mind of a sleeping Luigi, who is a powerful, brave hero in his dreams.